Forum Home > eBay, LeBonCoin, Mercado Libre, Yahoo Japan, etc. > Yet another OPPORTUNISTIC asking price for a 7A38 ! to use to highlight examples of obviously opportunistic Buy-it-Now asking prices by eBay sellers. I was prompted by the UK seller 'happydays359', who listed a rather average-looking example of a stainless 7A38-7190 overnight. 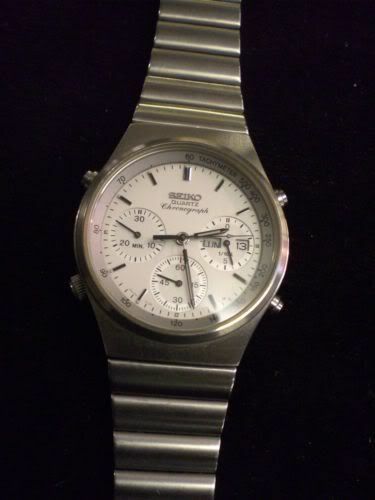 NICE RARE & COLLECTABLE VINTAGE GENTS SEIKO QUARTZ CHRONOGRAPH. MODEL 7A38-7190. 1980'S MODEL?? STAINLESS STEEL CASE & ORIGINAL SEIKO STAINLESS STEEL BRACELET. IN GOOD WORKING ORDER. ALL PUSHERS WORK & FUNCTIONS/SETTINGS WORK FINE. WHITE DIAL, WITH THREE SUB DIALS FOR HOURS, MINUTES, SECONDS. DAY & DATE APERTURES AT 3 '0' CLOCK. THE DIAL IS IN NICE CLEAN CONDITION. CRYSTAL IN REASONABLY GOOD CONDITION FOR AGE WITH SOME SURFACE SCRATCHES. THE CASE & BRACELET HAVE SURFACE SCRATCHES ALSO. THERE ARE SOME SCRATCHES TO THE CASE BACK. THE BRACELET IS ON THE SMALL SIDE AND WILL FIT UP TO A 7 INCH WRIST MAXIMUM. SELLING AT WHAT I CONSIDER TO BE A FAIR VALUE BUT ALSO OPEN TO REASONABLE OFFERS. ANY QUESTIONS PLEASE E-MAIL ME. THANKS FOR LOOKING. By way of comparison, let me just give you these 2 examples. This watch is in good overall condition cosmetically but does not run so would need some attention. Sold as seen no returns on this item. Watch will be sent after cleared payment has been recieved. Uk bidders only. .... but also came with a lightly worn 7T32-7F80 (also needing a new battery) - both for the combined price of £57.88 !! So Yes - 7A38 prices may be creeping up gradually in response to demand, but for heaven's sake - let's keep a grip on reality. I note the eBay seller has since dropped their Buy-it-Now price from their original ridiculous £295 to a merely laughable £175. Try another hundred, and you may be getting close. Went unsold. Now re-listed as a normal 7-day auction, with an opening bid price of £79.99 - and I guess it may well sell at that price. Welcome to the REAL world. Oh Happy Days. Indeed that stainless 7A38-7190 sold for £82 yesterday evening, after only two bids. It didn't appear to be in such good condition; had lost it's original bracelet and was fitted with a leather strap. The seller had started the bidding at 99 pence. Yet that one, by comparison, made £87 after 21 bids - the listing received 676 views. Seems that it is better, on some occasions, to let the market decide the selling price, rather than by setting a high opening bid. I'm still trying to figure out the eBay. The inconsistencies with the page views as well as the final bids for similar items I think may be attributed to people who have saved certain sellers as "favorites"? So they check them more often? Obviously, the better the descriptive heading, etc. the more searchable you are. But my hypothesis assumes two similar watches with equal descriptions, but listed at different times and by different people. Has anybody seen this auction? Nice price for it, isn`t it? That one has been (re)listed for literally months - since late September, last year. I thought everybody else would have seen it - that's why I didn't bother mentioning it. At least she has bought the asking price down a bit now - it was 350 Euros before !! I did message the seller a while back, and sent her links to two ended eBay auctions, too .... all to no avail. I did naturally compliment her on her nails. What ? Nobody prepared to risk making a comment on the 7A38-7029 listed yesterday ? 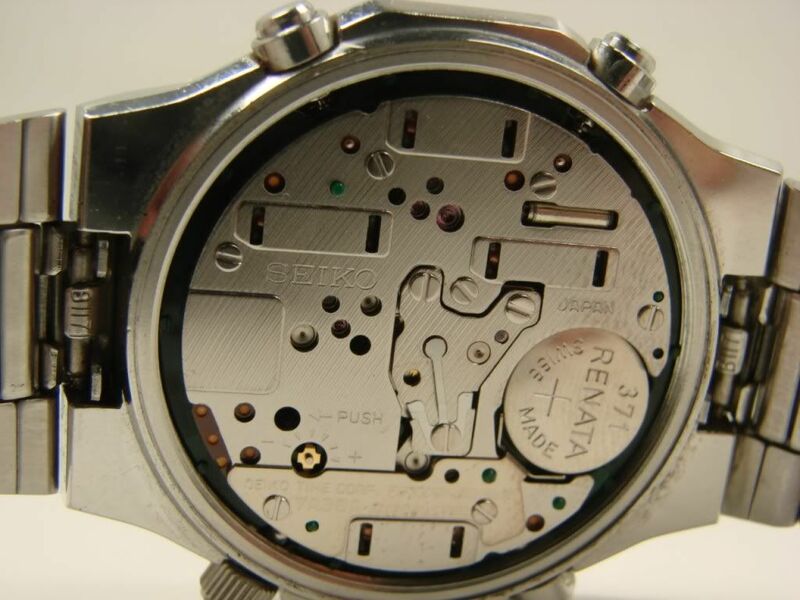 MOVEMENT: SEIKO QUARTZ MOVEMENT CALIBER 7A38 WITH QUICK SET DAY-DATE AND CHRONOGRAPH FEATURES. CASE: STAINLESS STEEL . APPROX 38MM IN DIAMETER EXCLUDING THE CROWN. BRACELET: ORIGINAL STAINLESS STEEL SEIKO BRACELET. 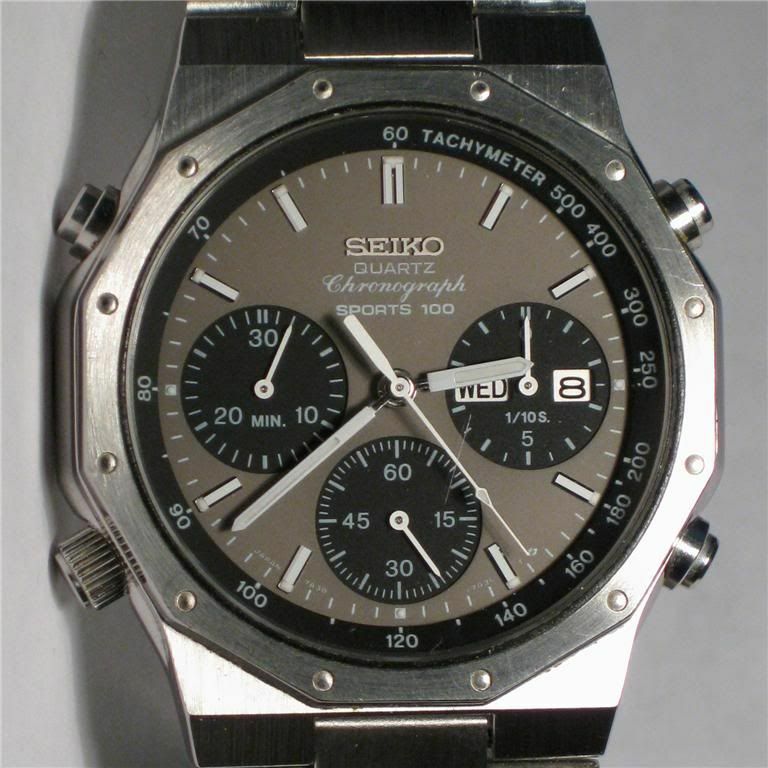 COMMENTS: VERY NICE AND CLEAN SEIKO 7A38-7029 CHRONOGRAPH WATCH. THE WATCH KEEPS PERFECT TIME, THE QUICK SET DAY-DATE WORKS FINE, THE CHRONOGRAPH STILL FUNCTIONS WHEN I PRESS BUTTONS BUT I DON'T KNOW HOW TO OPERATE IT. 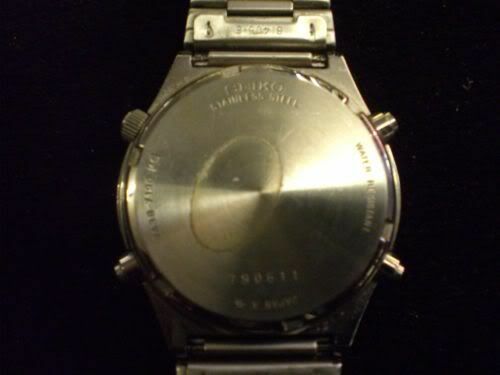 SHOWS MINOR HAIRSCRATCHES ON THE UNPOLISHED CASE AND BRACELET. THE CRYSTAL HAS COUPLE OF TINY HAIRSCRATCHES ON THE SURFACE. 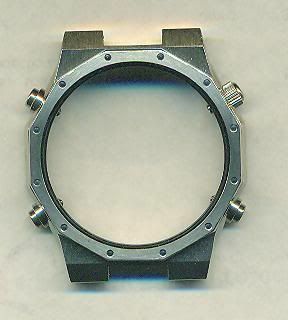 THE WATCH FITS UP TO AN 7 1/2 INCHES WRIST. VINTAGE WATCH IS NOT RECOMMENED USING WITH WATER UNLESS SAID SO. The Buy-it-Now asking price is $495 (approx. £312.42). The seller has listed it for 30 days, so he's obviously ready for a long haul. That's a businessman right there! A raft of other Seikos all up at daft prices. Plus loads of others watches that I have no knowledge of. There must be a whole lot of mug money in the world keeping these 'traders' in business. Probably to someone who hasn't done his homework (the highest price I have on record, for one of these - well actually it was a stainlesss 7A38-7020, rather than a -7029, is 235.56 Euros on eBay Germany, last November). Although relatively common, they're one of the most sought-after 7A38s. 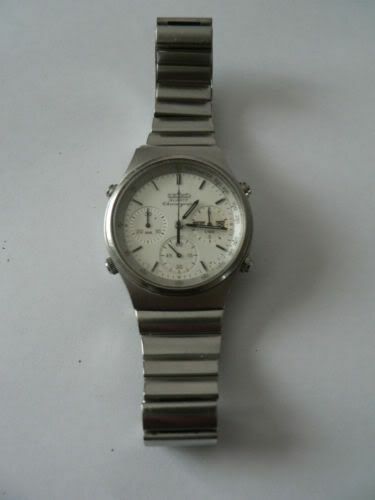 Maybe someone looking to replace that long-lost watch from 25 years ago is still desperately searching for 'the one'. Just browse some of the other major forums, and see how many WTB's you'll find posted over the years. Regarding this particular example, it's not 'the best'. The watch case may still have its vulnerable razor-sharp edges, but I'd be a little suspicious* because the bezel isn't quite perfectly aligned to the case. Look at the SEIKO logo - the off-white paint is lifting, and the lume on the hands is slightly discoloured - both of which point to possible previous moisture ingress or maybe even battery leakage. 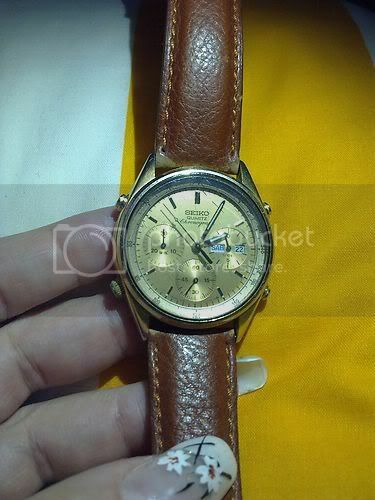 The "SEIKO" on the dial is gold plated metal, found on many of the 7Axx's we cherish, they are prone to damage from water ingress or battery acid leakage. Could be replaced but quite fiddly I can imagine. 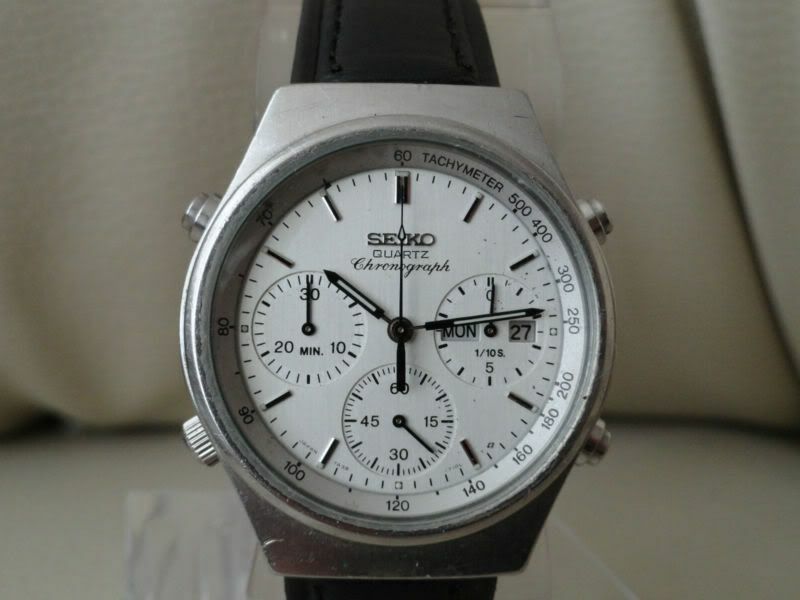 To be honest, I decided to give the badly acid damaged 7A38-7080 listed in the US recently a miss for that exact reason, The dial was ok apart from the "SEIKO" logo which was going green,LOL. A little (LOT) off topic (Paul feel free to edit if you wish). 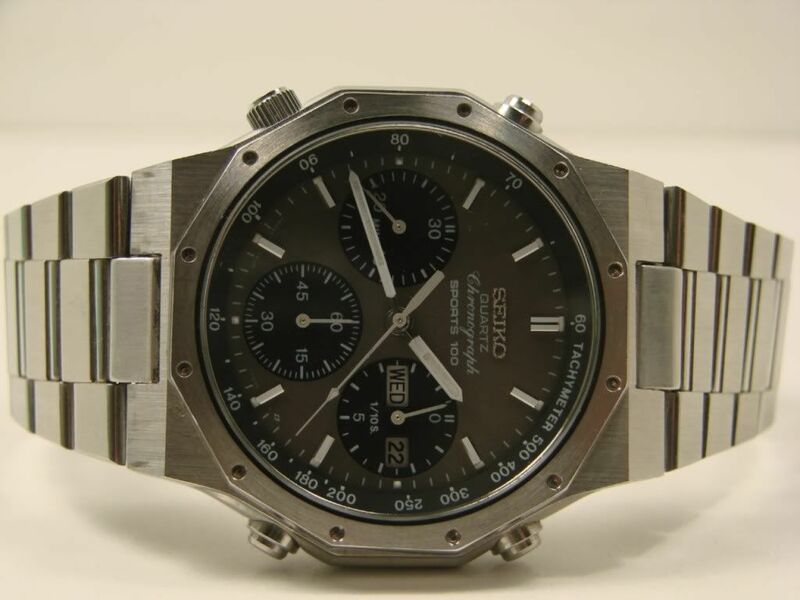 I just spotted this Seiko 120879054326, the buyer would need use of it to work out his debts after purchase, LOL ! Excuse my correcting you, Chris, but I think I know my 7A38s a little better. Trust me, I have three 7A38-7029's. It's off-white. No worries Paul, I stand corrected. I just noticed the post costs for the calculator watch! A little (LOT) off topic (Paul feel free to edit if you wish). 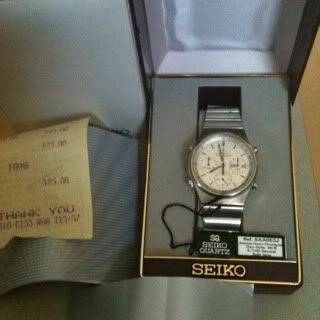 I just spotted this Seiko 120879054326, the buyer would need use of it to work out his debts after purchase, LOL ! I'll allow you that one Chris - a clever play on words. .... both of which point to possible previous moisture ingress or maybe even battery leakage. Nope - looks pretty clean inside. Wrong sized battery - #371 instead of a #394 fitted, but that's all that's immediately obvious. I'm not sure if your post belongs here, or would have been better added to James' 'The lower end & bottom of the 7Axx barrel' thread. But either way, I hate to tell you .... this really old news ! Vanman2USA has been periodically relisting that water-damaged 7A38-7070, in rotation with a 7A38-7069 without bracelet; dog-eared looking 7A38-7180 and a WAY over-priced gold-tone 7A38-7280 (which actually works) - for literally YEARS on end ! Thing about 'Vanman' is he never seems to get the message, and keeps on re-listing them at the same ridiculous prices. He (like Firefly) is a standing joke on SCWF. Try running a search on there on Vanman (without the '2USA'). I guess I've just got used to ignoring them, after seeing them come up so many times. Oops! Yes, he has been at it a while hasn't he? To be honest, I used to visit forums just to learn about the watches and get tips on watch repairing. It's only recently since I have been making a few purchases that I have taken an interest in eBay wheeler dealers. Still got a lot to learn. Indeed that 7A38-7029 did sell, as I predicted - and sold for a very strong $390.00 (approx: £245.41) earlier today.